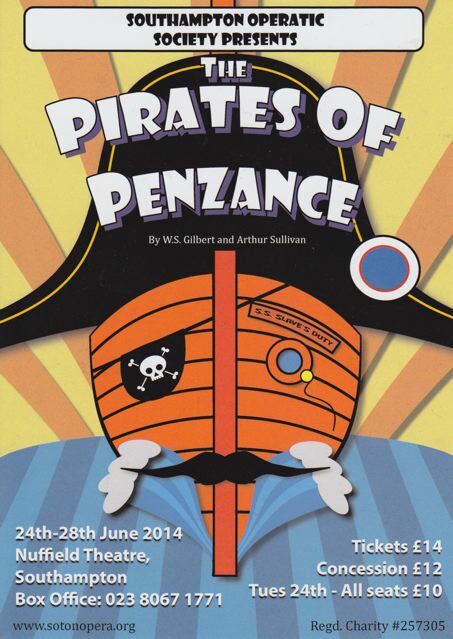 David Tatnall was expected to direct the Society’s latest production of The Pirates of Penzance. He had plans to resurrect an idea that he used with DYT in 2002 in which the ‘pirates’ were actually evacuees sent to Cornwall whilst the ladies’ chorus became members of the local Girl Guide Troup. Initially the Committee seemed interested in the concept but once one member expressed concerns about the entire company acting as ten year olds, others followed and the idea was shelved (including a Paradox / Pair of Ducks routine). It would have been interesting to see how the vision was accepted at Harrogate (the new home of the International G&S Festival) but, after the views of the adjudicator on the last visit, enthusiasm for that project had also waned. Vic Luke, however, was tempted to try her hand at a G&S production and with Nigel Finch as MD, they planned a lively, traditional version. Rehearsals for the men began with lessons in sword fighting and some of the younger members, notably Dominic Sly, Toby McLellan and Matthew Pike (Samuel), achieved an impressive standard. Unfortunately, once the action was transferred to the pirates’ galleon on the Nuffield stage, there was little room to brandish a sword realistically. The ship was quite spectacular. It had been previously used in a pantomime and was exactly what Vic needed but as nobody was willing to make the set it had to be hired. The future of Nursling as a resource would now become a major concern for the Committee as its lack of use, coupled with a large rent increase, had turned it into a drain on the Society’s finances. The costumes were a striking feature of this show. The Wardrobe Team (Jan Sly, Penny Hawkesworth and Maureen Street) had worked tirelessly to create new colourful dresses for the ladies and they lit up the stage. Indeed, the ladies’ chorus itself was formidable - the slickness of their routines matched their fine attire.